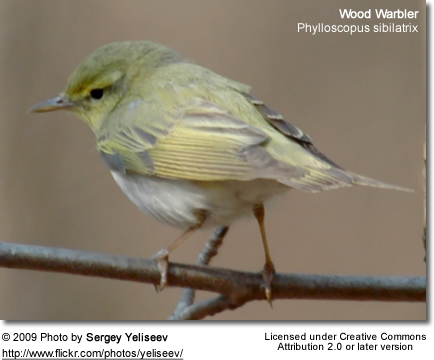 The Wood Warbler Phylloscopus sibilatrix is a common and widespread leaf warbler which breeds throughout northern and temperate Europe, and just into the extreme west of Asia in the southern Ural Mountains. 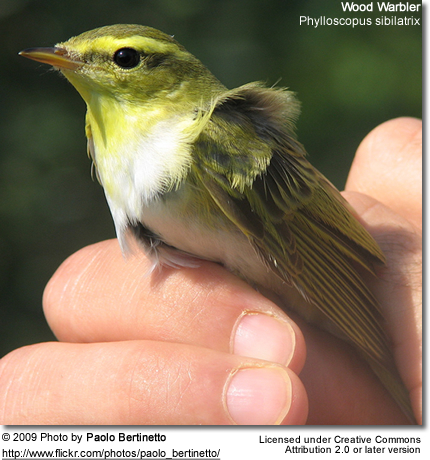 This warbler is strongly migratory and the entire population winters in tropical Africa. This is a bird of open but shady woodlands, such as beech and sessile oak, with some ground cover for nesting. The nest is built near the ground in low shrub. Like most Old World warblers, this small passerine is insectivorous. 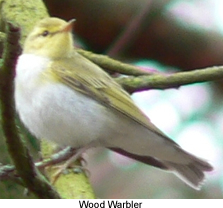 The Wood Warbler is 11-12.5 cm long, and a typical leaf warbler in appearance, green above and white below with a lemon-yellow breast. 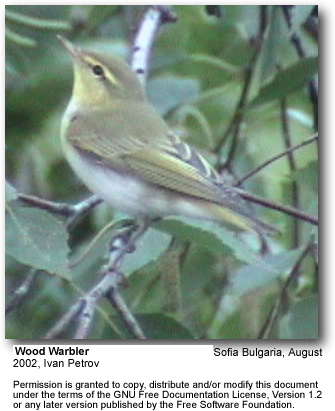 It can be distinguished from similar species, like the Chiffchaff P. collybita and the Willow Warbler, P. trochilus by its yellow supercilium, throat and upper breast, pale tertial edges, longer primary projection, and by its shorter but broader tail. It has two song types, often (but not always) given alternately; a high-pitched fluid metallic trill of increasing tempo pit-pit-pitpitpitpt-t-t-ttt lasting 2-3 seconds, and a series of 3 to 5 descending piping notes of lower pitch piüü-piüü-piüü. The contact call is a soft piping note, similar to the second song type, but shorter and given singly, "piü".